Coronation Street sisters Sally Metcalfe (Sally Dynevor) and Gina Seddon (Connie Hyde) haven’t been getting on too famously recently. There was plenty of bad blood between them and it was more than just a sibling rivalry as Gina tried to steal Sally’s man. However on tonight’s episode of the ITV soap, Gina decided to make tracks and leave her sister in peace. Sally wanted her sibling off the cobbles immediately considering they had just been involved in the factory collapse which almost saw the former killed. Coronation Street spoilers: Does Tim die? Is Tim leaving Corrie? 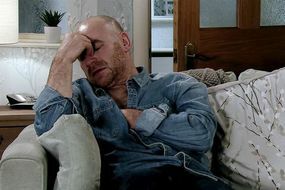 However, Gina had hung on for a while, and it was lucky she did so considering her husband, Tim Metcalfe (Joe Duttine) was unwell. On yesterday’s episode, he suffered from a heart attack and it was a big wake up call for the family. Thankfully, he was fine and advised to take it easy and watch what he was eating. The scare had a positive effect on Sally, who was being bombarded by texts from Gina.